Here’s look at the outcome you’ll be able to produce by the end of this lesson. Create a new document by selecting File > New and set the setting as shown in the image below. Now, place the underwater image by selecting File > Place. Place it as shown in the image below. Add a layer mask to it by clicking on the second button on the layer panel at bottom right side. Grab the brush tool by pressing (B) on the keyboard. Use a soft round basic black brush to hide the upper part of underwater as shown in the image below. You can see the result below. Duplicate the underwater layer and move it to the right as shown in the image below. Place the underwater image again but this time in the center of the main document as shown in the image below. Add a layer mask to it and use a soft round basic black brush to hide it’s parts to blend it properly to the scene. Here are the results. Now select all the underwater layer then press (Ctrl+E) on keyboard to merge all three layer into a single layer. Now, add a Brightness/Contrast adjustment layer as clipping mask to the underwater layer (see the image below for New Adjustment layer button and clipping mask button). Set the setting as shown in the image below. On the layer mask of Brightness/Contrast Adjustment layer I hided the selected effect as shown in the image below. Now, add a Curves adjustment layer to the underwater layer as shown in the image below. Now, place the sky below the underwater layer. Now, add a Curves and Exposure adjustment layer to the sky image. Set the setting as shown in the image. On the layer mask of Exposure adjustment layer I hided the selected effect as shown in the image below. Add a Color Balance adjustment layer to the sky as shown in the image below. Add a Brightness/Contrast adjustment layer to the sky. On the layer mask of Brightness I hided the selected effect as shown in the image below. Now, place the underwater 1 image above the underwater layer and activate the Free Transform tool by pressing (CTRL + T) on keyboard. Resize it, so it can cover the entire scene. Add a layer mask to it and using a soft round basic black brush hide the selected part as shown in the image below. Change the blend mode of underwater 1 to soft light. Here are the results. Add a Gradient Map adjustment layer above the underwater 1 without clipping it. Set the setting as shown in the image below. Change the blend mode of Gradient Map to soft light and reduce the opacity to 69%. Here are the results. Extract the tortoise using your favorite selection tool then place it to the main document as shown in the image below. Add a layer mask to tortoise and partially hide the underwater area of the tortoise by painting in the layer mask about 30% opacity and flow with soft round basic black brush. Add a Hue/Saturation and Brightness/Contrast Adjustment layer to the tortoise to blend it the scene. On the layer mask of both adjustment layers I hided the selected effect. Add a Photo Filter adjustment layer to the tortoise and set the setting as shown in the image below. Reduce the opacity of Photo Filter to 80% and here are the results. In this step, we’ll add water waves to the scene. Place the water waves image to the main document as shown in the image below. Add a layer mask to the water waves and hide the parts of water waves as shown in the image below using a soft round basic black brush. Now, change the blend mode of water waves to hard light and reduce the opacity to 50%. Here are the results. 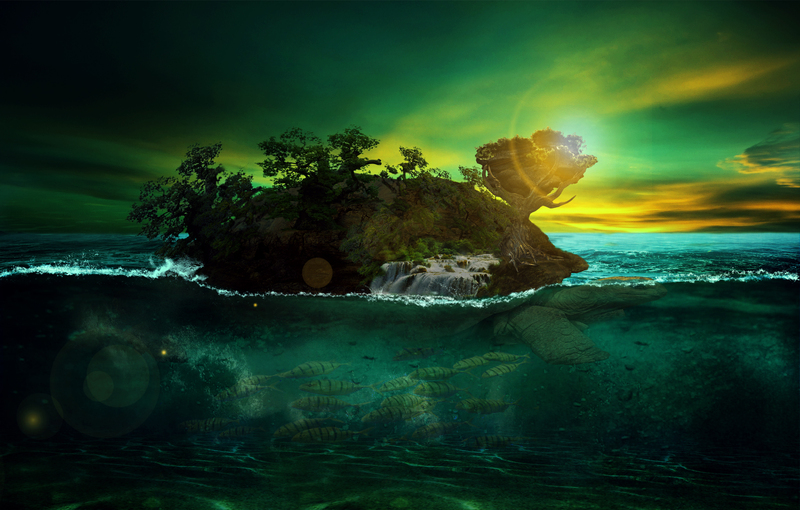 To blend the water waves to the scene I added the Brightness/Contrast and Curves adjustment layer to it. Now, duplicate the water waves layer two times including Brightness/Contrast and Curves adjustments layer. Position it in different places like shown in the image below to get more water waves inside the underwater. Here are the results. Add the Volcano image to the main document as indicated below. We only need the selected parts (see the image below) of volcano not the rest of. Add a layer mask to it and hide the unwanted part to blend it to the tortoise. Set the blend mode of volcano to hard light. Here are the results. Now, duplicate the volcano layer two times and place it to left and right to cover the tortoise parts (don’t forget to use the layer mask) as shown in the image below. Now, select all the valcano layer and then press (Ctrl+G) to group them. Name this group ‘Island’. Then add a Hue/Saturation adjustments layer to the Island group. Set the setting as shown in the image below. You can see the results below. Place the tree image to the main canvas. Add a Brightness/Contrast and Photo Filter to the tree. Set the setting as indicated by below image. On the layer mask of Brightness/Contrast adjustments layer I hided the selected part as shown in the image below to brighten the right part of the tree. Place the stone image to the main document as shown in the image below. Add a layer mask to the stone. Use a soft round brush tool to hide the unwanted parts as shown in the image below. Add Moss texture to the stone. Clip it to the stone layer then change the blend mode to Multiply. Reduce the opacity to 70%. Here are the results. Add the following adjustment layer to the stone. Reduce the opacity of 2nd Brightness/Contrast adjustments layers to 53%. Here are the results. Now, select all the stone layers and group them then name this group ‘Stone’. Duplicate the stone group and move it to the right as shown in the image below. Here are the results. In this step we’ll extract the tree 1 using Calculation technique. Open the tree 2 image in Photoshop. Goto Window > Channel. Choose the blue channel duplicate it by right clicking on it then choose duplicate channel. After that Goto Image > Calculation (Make sure that duplicated blue channel is selected). Then set the setting as shown in the image below. You can experiment with any blend mode but most of the situation the Overlay and Multiply blend mode works best. After using the Calculation, there will be an Alpha channel below the Blue Copy channel. Choose the Alpha Channel then load the selection by holding the Ctrl/Cmd key and then click on the thumbnail of Alpha channel. Go back to the RGB layer and add a layer mask to the tree 1. Here are the results after extracting the tree 1. Now, place the extracted tree 1 to the main document. Add a layer mask to it and hide the unwanted part using soft round black brush. Here are the results. As you can see we have so many rough edges on tree 1. We need to fix this. To fix it I added a blending option effect to the tree. Here are the values for blending options. As you can see by applying a blending option effect all the hard and rough edges have gone. We have pretty much decent results. I reduced the saturation of tree 1 by applying Hue/Saturation adjustment layer to it. Duplicate the tree 1 layer and move it to the left as shown in the image below. Don’t forget to hide the unwanted parts. Add a Blending Options effect to this layer again. Note that I have used same color for Inner Shadow used in previous step only the angle, distance, opacity are slightly different. Here are the setting. Add Brightness/Contrast adjusment layer to it. Here are the values. Duplicate the tree 1 again and place it, with the same Blending Option setting in previous step, as indicated by below. Here are the results. I added a Brightness/Contrast adjustment layer to it. Set the setting as shown in the image below and here are the results. Duplicate the tree 1 layer again and place it, with the same blending option effect in previous step, as shown in the image below. I added again a Brightness/Contrast adjustment layer to it. Here are the results. Duplicate it again and place it as shown in the image below. I have used the same color for inner shadow but this time I have changed the Opacity to 49%, Distance to 0, choke to 9 and size to 6. Add a Brightness/Contrast adjustment layer and set the setting as shown in the image. Now, extract the tree 1 again for last time. Use the free tranform tool by pressing (Ctrl+T) on keyboard to resize it then place it as shown in the image below. Don’t forget to hide the unwanted parts using layer mask. Here are the results. Add a blending options effect to it and this time overall setting are changed. You can see it below. Add a Brightness/Contrast adjustments layer to it. Set the values as shown in the image below. Here are the results. Select all the tree 1 layer and group them then name this group ‘Tree 1′. Add the Waterfall to the main document and place it as shown in the image below. Don’t forget to resize it using free transform tool. Add a layer mask to the waterfall and hide the unwanted parts of waterfall using soft round basic black brush. Here are the results. Add a Brightness/Contrast adjustment layer to the waterfall. Set the setting as shown in the image below. Reduce the opacity of Photo Filter to 60%. Here are the results. On the layer mask of Photo Filter adjustment layer I hided the selected effect as shown in the image below. Add a Color Balance and Photo Filter Adjustment layer to the waterfall. Here are the values of these adjustment layers. On the layer mask of Photo Filter I hided the selected effect. Here are the results. Select all the waterfall layers and group them. Name this group ‘Waterfall’. Select all the tree 1, stone and waterfall groups. Group them into a new group and name it ‘Created Island’. Add a Brightness/Contrast adjustment to the Created Island group. Set the setting as shown in the image below. Hide the selected the effect on layer mask of Brightness/Contrast adjustment as shown in the image below. Load the Water Splash brush in Photoshop. Use the water 07 brush to create a waterline like shown in the image below. I have used 7 layers to create this waterline. Below the waterfall I created another waterline. Then use warp tool to alter the shape of waterline as shown in the image below. I added some more water splashes as shown in the image below using water splash brushes. Now, we’ll add the lighting effects to the scene. I created a new layer by pressing (Ctrl+Shift+N) on keyboard then grab the brush tool and change your foreground color to #412b15. Set the opacity and flow to 100% with the size to 900 pixels then paint a big stroke as shown in the image below. Change the blend mode of this layer to Color Dodge and reduce the opacity to 50%. Here are the results. Now, again create a new layer then fill it with black color. Add a Lens Flare Filter to it by selecting Filter > Render > Lens Flare. Then set the setting as shown in the image below. . Here are the results on layer. Move it as shown in the image below. Set the blend mode of Lens Flare to screen. Don’t forget to hide the unwanted parts using layer mask because we’ll only need the Lens Flare as a light source. Here are the results. Add a Level and Hue/Saturation adjustment layer to lens flare as shown in the image below. Cut out fishes and place them as shown in the image below and use blend modes to blend them inside the underwater. I have used 7 layer to arrange them with different blend mode and opacity. Group all fish layer and name this group ‘Fish’. Add a Hue/Saturation to this group as shown in the image below. Load the Bubbles brush in Photoshop. Paint some bubble as shown in the image below. We need to paint some more lights on island. To do this, create a new layer and pick the brush tool with 30% opacity and flow. Change your foreground color to #634b11 and paint as shown in the image below. Change the blend mode to Color Dodge. Here are the results. We are almost done but still short of Final Adjustments. Add a Gradient Map adjustment layer to the scene and set the setting as shown in the image below. Change the blend mode of Gradient Map to soft light and reduce the opacity to 60%. Here are the results. On the layer mask of Gradient Map I hided the selected effect as shown in the image below. Now, add a Color Balance adjustment layer and set the setting as indicated below. Add a Brightness/Contrast adjustment layer. On the layer mask of Brightness/Contrast adjustment layer I hided the selected effect. Add the last final adjustment layers to the scene which is Selective Color adjustment layer. Thanks for following the tutorial. I am Bunty Pundir from New Delhi, India. If you want see my other artwork then you can visit my Facebook page. Thank You for this lovely tutorial, this is really inspiring. Perfect!..I love the way you guide during this tuts!